Set the scale to zero. On a mechanical scale, this will mean turning a knob to set the dial indicator to the zero mark. Balance scales will need the pointer set to the dead center mark. Refer to the user's manual that came with your digital scale on how to calibrate the scale to zero, as each manufacturer differs in its calibration setup. Weigh the container you plan to use to weigh food. If desired, you can use a permanent marker to write the weight of the container on the bottom so you do not have to do this step again. Measure food portions by uncooked weight. If your diet calls for 6 ounces of meat as a serving, that is 6 ounces before that meat hits the skillet or grill. 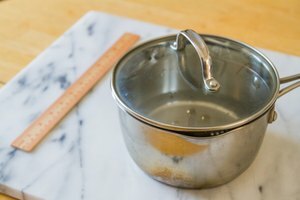 Use the scale to measure by weight for baking and other types of cooking instead of using measuring cups. This will give you a better measure of ingredients. 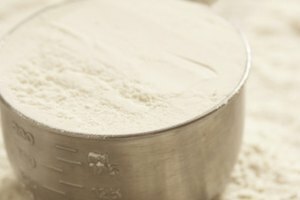 Many recipes now list the weight of ingredients along with the measure. Weigh and measure your ingredients for a recipe before combining. By using several different bowls, you can have all of your ingredients ready to go when you begin cooking. Keep your scale calibrated to zero. When you are weighing in portions of an ounce, slight discrepancies will make a difference. Some kitchen scales come with an attached bowl. This will limit the amount of food you can weigh to only what will fit in the bowl. 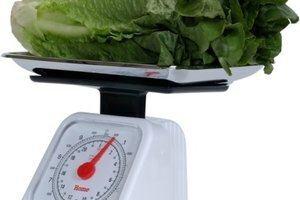 Before purchasing a kitchen scale, make sure that it will weigh the amount of food you are most likely to need. 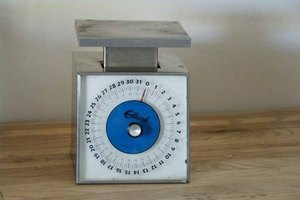 The maximum range that a scale can weigh can vary from under 2 pounds to more than 20.